SAUDI JOURNALIST DEMANDS MULTIPLE HUSBANDS FOR FEMALES WHO WANT THEM……. – The Tundra Tabloids……. SAUDI JOURNALIST DEMANDS MULTIPLE HUSBANDS FOR FEMALES WHO WANT THEM……. The clerics are raving mad! 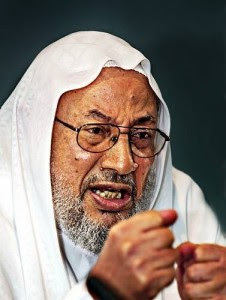 Sheikh Qaradawi: The West is to blame! Having female journalists is a grave error and un-Islamic! Saudi journalist stirs row after publishing article in favor of polyandry for women in Muslim world. A Saudi female journalist stirred a row in Egypt after publishing an article in favor of polyandry for women. The piece, published in the al-Masri al-Yaum newspaper, promotes the notion that women should be allowed to marry several partners, similarly to the right enjoyed by Muslim men. According to Islamic law, a man is allowed to be married to four different women at any given time, as long as he treats them equally. However, journalist Nadin al-Badir suggested that polyandry be permitted to both women and men. The female writer also proposed that Muslim men be banned from marrying more women merely because they are bored with their current partners. According to a BBC report Friday, a parliament member already filed a lawsuit against the newspaper for publishing the provocative item. As could be expected, the article also elicited angry responses among Muslim clerics, who argued that the ideas presented in it are anti-Islamic and that the journalist had no right to attack tradition. However, one cleric defended the article, claiming that it did not constitute an attempt to promote polyandry among women, but rather, it aimed to expose readers to the suffering of women as result of their husbands’ conduct. Previous Post Previous Post FINNISH ISLAMIC PARTY IN DISARRAY AS SPOKESMAN ABDULLAH TAMMI STEPS DOWN FOR CONDEMNING CHECHEN TERRORISM IN TOO STRONG OF TERMS……. Next Post Next Post IRANIAN TROOPS MAKE PARTIAL WITHDRAWAL FROM IRAQI OIL WELL……. Can a woman have more than two husbands? No, a woman cannot have more than two living husbands. A man has no choice, as he must be in wedlock with one wife. But a woman has three choices. Firstly, no wedlock with a husband. Secondly, wedlock with one husband. Or thirdly, wedlock with two husbands. That’s it, there are no further choices for a woman, and there is no choice at all for a man. 1 Corinthians 7:2 King James 1611. Nevertheless, to avoid fornication, let every man have his own wife, and let every woman have her own husband. Yr. 1783. 10th George Prince of Wales Own Hussars. (King George III). Yr. 1898. 19th Alexandra Princess of Wales Own Hussars. (Queen Victoria). Therefore two women can own a regiment of cavalry, and two men can own a regiment of cavalry. 1 Corinthians 6:16 King James 1611. What! know ye not that he which is joined to a harlot is one body? for two, saith he, shall be one flesh. A husband and wife who lie together by carnal copulation shall be one flesh. A man and courtesan/prostitute who lie together by carnal copulation shall be one flesh. A man and common courtesan or common prostitute who lie together by carnal copulation shall be one flesh. An adulterer and adultress who lie together by carnal copulation shall be one flesh. An adulterer and fornicatress who lie together by carnal copulation shall be one flesh. A fornicator and adultress who lie together by carnal copulation shall be one flesh. A fornicator and fornicatress who lie together by carnal copulation shall be one flesh. Clearly the New Testament lays down that a man must be in wedlock with his own wife, and a woman must be in wedlock with her own husband. Furthermore the New Testament specifically limits the number of wives that a man can have to only one, but sets no limit to the number of husbands a woman can have. But there must be some limit for a woman, or one woman could be in wedlock with thousands of men. Rationally, if one woman can satisfy the bodily lust of one man every day, and forty men can satisfy the bodily lust of one woman every day, then is one wife for every man and forty husbands for every woman what the New Testament requires? No, because the New Testament is a document of truth, not a document of reason. Luke 1:28 King James 1611. Luke 1:31 King James 1611. Luke 1:28-35 King James 1611. In the New Testament, the angel Gabriel came in unto Mary, a virgin woman, and Mary conceived and delivered her firstborn son, Jesus, the son being God the Son, the father being God the Father. And when Mary’s womb delivered her firstborn son Jesus unto the world, then Mary was like all women delivered of a firstborn son unto the world, as a woman’s firstborn son can never belong to the mother but must belong to the Lord God. Luke 2:23 King James 1611. Exodus 13:2&12 King James 1611. And so like all women delivered of a firstborn son, Mary was no longer a virgin woman, but like all said women, Mary was a holy woman. Matthew 13:53-56 King James 1611. Mark 6:1-4 King James 1611. And husband Joseph Jacob came in unto Mary and husband Joseph Heli came in unto Mary, and Mary conceived and delivered Jesus’ brothers, James, Joses, Simon, Judas, and also Jesus’ sisters. Matthew 1:6&16 King James 1611. Luke 3:23&31 King James 1611. Joseph Jacob was the descendent of King David’s son Solomon, and Joseph Heli was the descendent of King David’s son Nathan. Genesis 38:16-18 King James 1611. “Came in unto her” means congress or carnal copulation. In the Old Testament, Judah came in unto Tamar, his daughter-in-law, and Tamar conceived and delivered twin sons. Tamar had lain in wait for Judah on the side of a far away road, and Judah had been unable to recognize Tamar because she was wearing a veil, and only common harlots wore veils. Upon first seeing this strange woman wearing a veil, Judah bargained a payment of his personal signet ring, his personal wrist bangles, and his personal walking staff, for coming in unto her. Tamar had been in wedlock with Judah’s first son, who God had killed for being wicked. Tamar had then been in wedlock with Judah’s second son, who God had then killed when he saw the second son deliberately spill his seed on the ground during carnal copulation with Tamar. Judah then pledged Tamar that she could marry his third son when he became old enough for wedlock. But when his third son became old enough to marry, Judah broke his pledge and forbade his third son to marry Tamar. When Tamar was seen in her third month to be heavy with child, Judah was told that Tamar was with child through harlotry. Judah then summoned Tamar to him in order to be burnt to death for harlotry. Tamar came and Judah demanded that Tamar tell him by which man she was with child. Tamar then produced the signet ring, the wrist bangles, and the walking staff, and said the man who gave me these is the man by whom I am with child. Then Judah confessed to all that he had broken his pledge and sinned by going back on his word that Tamar could have wedlock with his third son when his third son became of age, and then denying such wedlock to her. Six months later Tamar safely gave birth to the twin sons conceived with Judah. Genesis 1:27-28 King James 1611. Genesis 2:7&18-19 King James 1611. Genesis 3:20 King James 1611. The first man and first woman in this world were Adam and Eve. Adam means “man” in the hebrew tongue, and Eve means “life” in the hebrew tongue. Therefore a man is man, but a woman is life. Romans 7:4-6 King James 1611. Old Testament law dead and gives as an example that a woman can have more than one husband. 1 Timothy 3:2 King James 1611. A bishop can have only one wife, and as he must be an example to other men, a man can have only one wife. 1 Timothy 3:12 King James 1611. A deacon can have only one wife, and as he must be an example to other men, a man can have only one wife. Titus 1:6 King James 1611. An elder can have only one wife. 1 Timothy 5:4&9 King James 1611. Elders are not to provide for widows under three score years of age without children, who have only had one husband. The Estate of Marriage. Martin Luther 1522. Although Martin Luther confirmed that a woman could have two husbands, he nevertheless immediately restricted it to women who were in a marriage which had produced no children and who had then obtained permission from their first husband to take their second husband. Confusingly, Martin Luther did not make it clear as to how long a woman had to wait before taking her second husband. To sum up, the New Testament upholds the example of deacons, elders, and bishops, for men to follow. That example is one wife. The New Testament also lays down that the Old Testament no longer applies to men or women, except for the 10 Commandments, and gives as an example of this that a woman is no longer bound to have only one husband. If men must follow the example of the male Christian leader, whether bishop, deacon, or elder, then surely women must follow the example of the female Christian leader. What leader is that? The primary one in the New Testament is Mary, the Mother of Jesus, God the Son. Luke 1:35&41 King James 1611. Mary had carnal copulation with three men. The Angel Gabriel, Joseph Jacob, and Joseph Heli. However, Mary was only in wedlock with two men, Joseph Jacob, and Joseph Heli. Furthermore, the Angel Gabriel was not a man of this world, and he seems not to have taken a fully visible male form when he had carnal copulation with Mary as ordered by God the Father, for it appears that at some stage God the Holy Ghost came upon or entered Mary. Either this was at the moment Mary conceived or immediately afterwards. After Mary conceived, she immediately went to visit her cousin Elisabeth, who was six months with child, a son, who also had been conceived when Elisabeth had been filled by God the Holy Ghost. Accordingly it would be fully in accordance with the New Testament for a man to have one wife, and a woman to have two husbands. That the Angel Gabriel had carnal copulation with Mary is both interesting and theologically necessary, but it is not enough of an example for a woman to attempt to take a third husband in wedlock, whilst her first and second husbands still liveth. Matthew 19:11-12 King James 1611. The New Testament does not give man any choice; he must have wedlock with one woman. Although do bear in mind that Jesus, God the Son, was not in wedlock with any woman. But the New Testament gives a woman three choices. Virgin woman with one husband in wedlock without child. Virgin woman with one husband in wedlock with female child or female children. Holy woman with one husband in wedlock with firstborn male child. Holy woman with one husband in wedlock with male child or children together with female child or children. Holy woman with two husbands in wedlock with firstborn male child. Holy woman with two husbands in wedlock with male child or children together with female child or children. A number of denominations have a service for wedlock, but so far every one of them has inserted words that clearly say a woman may be in wedlock with only one man at a time. Even the State Lutheran Evangelical Church of Sweden states this, despite Martin Luther himself saying that a wife can be in wedlock with two living husbands. But what do you expect. After all, Martin Luther stated in writing that under no circumstances was anyone to call himself a “Lutheran” and under no circumstances was any church to call itself a “Lutheran Church”. So what do all northern europeans called themselves? Lutherans! Ask them what church they belong to? The Lutheran Church! A number of denominations do not have any service for wedlock, on the grounds that wedlock is not a church matter, as it is a state matter. But every such denomination has nevertheless inserted words in that denomination’s discussion of wedlock, that firmly says that a woman can only have one husband in wedlock at a time. Nowhere do any of the denominations give any explanation for their defiance of the New Testament. Of course that just might be because there is neither any justifiable explanation or excusable explanation for such defiance. Still, just looking at using only the principle of choice as a guide, all the above denominations are pointing in the right direction, even if they are not pointing down the correct path. That is, a man has no choice, he must make efforts to be in wedlock with one wife at some stage of his life here in this world. And a woman still has a choice, in that she may choose not to be in wedlock with a man in this world, or she may choose to be in wedlock with one husband at some stage of her life here in this world. This means that the principle of a woman having a choice remains intact. The defiance of both the Lord God and the New Testament by the various denominations by the removal of a woman’s option to make efforts to be in wedlock with two husbands at the same time at some stage of her life in this world, still leaves intact the principle of choice for the woman and no choice for the man. Constitution of The Spartans (Xenophon). 388 B.C. League of The Iroquois (Lewis Henry Morgan). 1851 A.D.
Only two non-christian groups in the world have been known to practice New Testament wedlock. The Spartans and the Mohawk. Only monandry and diandry, or New Testament style wedlock, was lawful among the Spartans, citizens of the greatest of the greek city-states, Sparta, and history’s final saviours of Western Civilization at Thermopylae (The Hot Gates) in 480 B.C. And only monandry and diandry, or New Testament style wedlock, was lawful among the Mohawk, citizens of the greatest of the eastern woodland North American tribes, which forever blocked France’s attempt to seize New York so as to split England’s colonies in twain. Much criticism of both the Spartans and the Mohawk, has been leveled by outsiders who complain of the extreme freedom of the females and the extreme militarism of the males. It must be noted that there is no record of any Spartan male, Spartan female, Mohawk male, or Mohawk female, complaining of female freedom or male militarism. Whatever your point of view on Spartan life or Mohawk life, the New Testament lays down cast-iron guidelines for wedlock. The fact that the New Testament complies with Spartan law and Mohawk law is irrelevant. Of absolutely no relevance to this discussion, the symbol of the United States of America is the bald headed eagle, which is a species that uses both monandry and diandry for conception, and where the one male or two males reside in the exactly the same nest as the one female. The one female and either the one male or two males, stay in the nest together and raise the chick together. Mark 10:7 King James 1611. Ephesians 5:31 King James 1611. Both husbands must leave their families to go and become a member of the wife’s family, or the one husband must leave his family to go and become a member of the wife’s family. THE NEW TESTAMENT FORBIDS MOHAMMEDRY. THE NEW TESTAMENT FORBIDS POLYGAMY. THE NEW TESTAMENT FORBIDS CLITORECTI. THE NEW TESTAMENT FORBIDS MONKERY. THE NEW TESTAMENT FORBIDS POPERY. THE NEW TESTAMENT FORBIDS CASTRATI. CAPITAL LAWES OF THE GOVERNMENT OF THE MOHAWK. 1st. If any person within this Government of The Mohawk shall by direct, exprest, impious, or presumptuous ways, deny the true God and his Attributes; he shall be put to death. 2nd. If any person within this Government of The Mohawk shall maliciously and on purpose deny that any Mohawk person may have arms for his defence suitable to his condition and as allowed by law; he shall be put to death. 3rd. If any person shall commit any willful murder, which is manslaughter, committed upon malice, hatred, or cruelty, not in a man’s necessary or just defence, nor by mere casualty against his will; he shall be put to death. 4th. If any person shall slay, or cause another to be slain by guile or by poisoning or any such wicked conspiracy; he shall be put to death. 5th. If any man or woman shall lye with any beast or brute creature by carnal copulation; they shall be put to death, and the beast shall be burned. 6th. If any man lyeth with a man or mankind as he lyeth with a woman; they shall be put to death, unless the one party were forced or under fourteen years of age, in which case he shall not be punished. 7th. If any man forcibly stealth or carrieth away any woman or womankind; he shall be put to death. 8th. If any person shall bear false witness maliciously and on purpose to take away any person’s life; he shall be put to death. 9th. If any man shall traitorously deny his Clanmother’s right and titles to her Eagle Feathers and Dominions, or shall raise arms to resist her Authority; he shall be put to death. 10th. If any man shall treacherously conspire or publiquely attempt, to invade or surprise any town or towns, fort or forts, within this Government of the Mohawk; he shall be put to death. 11th. If any child or children, above sixteen years of age, and of sufficient understanding, shall smite his or their Natural Mother or Lodgemother, unless thereunto provoked and foret for the self preservation from death or mayming, then at the complaint of the said Mother and Lodgemother, and not otherwise, they being sufficient witnesses thereof; that child or those children so offending shall be put to death. 12th. If any stubborn and rebellious son or sons, above sixteen years of age, and of sufficient understanding, shall not obey the voice of his or their Natural Mother or Lodgemother, and that when the said Mother or Lodgemother have chastened such son or sons will not hearken unto them, then at the complaint of the said Mother and Lodgemother, and not otherwise, they being sufficient witnesses thereof; that son or those sons so offending shall be put to death. 13th. If any unmarryed man above twentyeight years of age and under fortytwo years of age shall maliciously and on purpose refuse wedlock for over fourteen days with any marryed woman under sixtythree years of age, said marryed woman having borne a son, or unmarryed woman under sixtythree years of age; he shall be put to death. 14th. If any person shall maliciously and on purpose deny any marryed woman wedlock with two husbands, said marryed woman having borne a son, or any unmarryed woman wedlock with one husband; he shall be put to death. 15th. If any marryed man shall lye with a woman by carnal copulation, other than his one wife; he shall be put to death. 16th. If any marryed woman shall lye with a man by carnal copulation, other than her two husbands or one husband; she shall be put to death. 17th. If any unmarryed man shall lye with a woman by carnal copulation; he shall be whipt thirteen strokes, unless he hath his Natural Mother and Lodgemother authorities, in which case he shall not be punished. 18th. If any unmarryed woman shall lye with a man by carnal copulation; she shall be whipt three strokes, unless she hath her Natural Mother and Lodgemother authorities, in which case she shall not be punished. 19th. If any person shall geld any man or mankind to take away generative power or virility; he shall be put to death. 20th. If any person shall geld any woman or womankind; he shall be put to death. Trump administration discourages use of ‘two-state solution’ 'No point in using phrase that never achieved peace,' White House official says. WHO IS THE IRGC'S NEW COMMANDER, MAJ.-GEN. HOSSEIN SALAMI? Despite US sanctions placed on Iran meant to pressure Tehran over its military activity in the Middle East and its ballistic missile program, Tehran is continuing to improve its missile arsenal.